Almost every application requires, or at least benefits greatly from, some kind of logging of events and errors. I suspect all of us have written custom code for logging to text files, database tables, the event log and other formats. We all know that we shouldn’t do this since there are several frameworks out there to help us, such as Microsoft’s own Tracing functionality, NLog and log4net. The obstacle to using them is often that it can be difficult to know how to configure them to work properly which is why this post will describe a set of configuration examples for log4net to make that framework do it’s magic. For those of you new to log4net it’s a really useful package but somewhat difficult to configure, which is what I will try to help with in this post. I will not try to write a tutorial for it since others have already done so. Instead I will show a set of confiuration examples I personally find useful. Log4net logging is based on a provider-like design where each type of logging is done in a so called appender. There are appenders for file system files, databases, etc. and it’s in these appenders that log4net’s power lies. We haven’t configured the referenced appenders yet, so that is the next step. The remainder of the post will be about some of the appenders that comes with log4net. This appender is very useful for console applications and enables different types of events (debug, info, error, etc) to be displayed in different colors. This appender is used to write to a file while limiting the file size. When the maximum file size is reached then a new file is created which means that no log file will be unmanagably large. The maxSizeRollBackups setting controls how many files will be created before the first one is deleted. You can control when log4net creates a new file (rolls the file) by setting the rollingStyle attribute. It’s default setting is Composite which combines date and size limitations, whichever occurs first, to decide when a new file is created. The other possible values are Size and Date which are self-explanatory, and Once which creates a new log file for every time the application is executed. Note however that, for some reason, the maxSizeRollBackups setting does not work when using Composite or Date so the number of files cannot be limited in when using those settings. 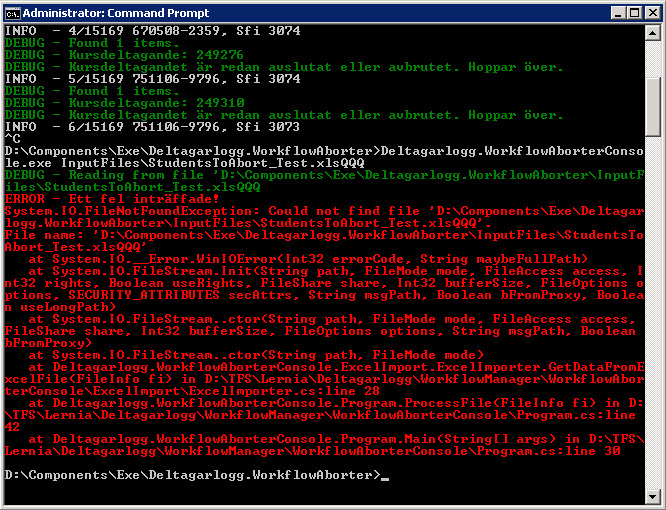 This appender logs to the Microsofts standard tracing framework in .Net. In Visual Studio, output is shown in the output window by default and for deployed applications it’s possible to configure the tracing to store events in different destinations. The appender could be useful if parts of an application is using the tracing framework and other parts are using log4net since it makes it possible to channel all events through the same framework (trace) but this is probably not used very often. A more useful side effect is that many test runners (e.g. nUnit and ReSharper’s built-in test runner) captures trace calls and stores them with the test result making test failure analysis much easier. 2011-02-04 03:00:31,265 INFO   - 6437 ska bearbetas. 2011-02-04 03:22:08,793 INFO   - 26532 ska bearbetas. Note that the 10 events prior to the ERROR event that triggered the mail is also included which makes error analysis very much easier. This appender is useful for automated tests. if (appender != null)   // Appender kommer vara null om inet loggats ännu. The configuration segment for AdoAppenders tend to be rather long but the example is fairly self explaining. For more so called “conversionPattern fields” to use in parameters, look here. These are the same fields used in the other appenders to format the log strings. There’s quite a lot of interesting data that can be retrieved so make sure to have a look at the list. 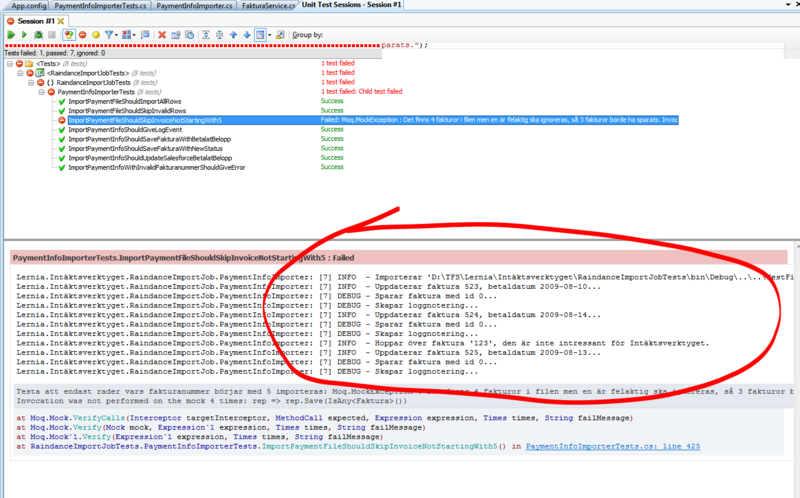 This tells log4net that DEBUG and INFO events from NHibernate should be ignored. The logger name is a string with the start of the logger names the filter should match. 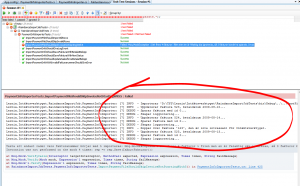 Other loggers can be configured in the same way and loggers that aren’t configured fall back to the root logger we defined in the beginning of this post. 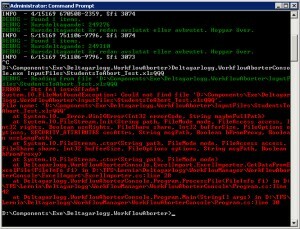 Q: What do you do when having trouble with log4net logging? A: You enable internal logging! Note that these events are logged using the System.Diagnostics.Trace system so that may have to be configured as well. For more info about internal logging, see here. That’s all for now. I’ll keep updating this post when I find more interesting settings.